The purpose of the National Collaborating Centres for Public Health (NCCPH) Knowledge Translation Graduate Student Awards is to recognize the work of graduate students regarding knowledge translation in public health in Canada. Defined by the Canadian Institutes of Health Research, knowledge translation is a dynamic and iterative process that includes synthesis, dissemination, exchange and ethically-sound application of knowledge to improve the health of Canadians, provide more effective health services and products and strengthen the health care system. Three awards were given at Public Health 2018, this year's annual Canadian Public Health Association conference. 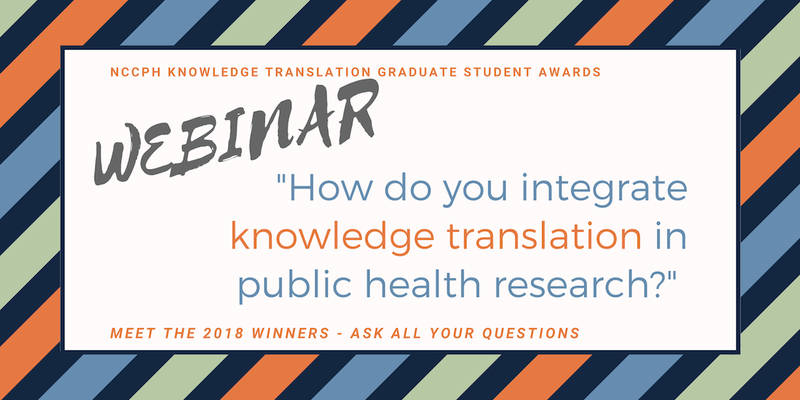 The NCCPH Knowledge Translation Graduate Student Awards Webinar features the work of the winners. Each student presented their topic and engaged with the audience in a question and answer period. This event was presented in English. Watch a video recording of the event in English (MP4 File, 120 MB). The presentation slides are available in English (PDF, 2MB). Les diapositives sont également disponibles en traduction française (disponibles bientôt).